Over the last five years, discussion about hydraulic fracturing (“fracking”) has increased in Virginia and around the country. In 2017, this culminated with American Rivers listing the Rappahannock River as the 5th Most Endangered River in the Nation due to the potential impacts associated with fracking. As a result, many localities in the Northern Neck, Middle Peninsula, and throughout the Commonwealth have taken important steps to protect their drinking water, local streams, public health and the overall rural character of their communities from industrial oil and gas development. And at the state level we now have some improved standards for in-state fracking, including full disclosure of the chemicals pumped underground during drilling. Peer-reviewed studies link fracking chemicals to a variety of health concerns including respiratory and neurological problems, several cancers, and endocrine disruption linked to cancers, infertility, and birth defects. It is critically important for first responders, localities, local residents and property owners with these drilling rigs on their land to know what is being pumped into their communities. FOR THREE YEARS IN A ROW, the General Assembly has rejected industry attempts to roll back these important chemical disclosure rules. This idea, to keep chemical secrets from the public, continues to rear its ugly head. Despite defeating these bills in past General Assembly sessions, there is currently another legislative attempt to erode these protections sitting in a subcommittee of the Freedom of Information Act (FOIA) Council and may end up in the General Assembly for a FOURTH YEAR IN A ROW. This is unacceptable. Take Action Now and tell the FOIA Council, your state legislators, and Governor Northam to keep chemical disclosures in place! Fracking companies should not keep chemical secrets. Let’s tell our elected officials to protect clean water. The America’s Most Endangered Rivers® report is one of the best-known and longest lived annual reports in the environmental movement. Every year, grassroots river conservationists team up with American Rivers to use the report to save their local rivers. The Rappahannock is not on this list because it is on of the nation’s “worst” or most polluted rivers, but because it is confronted by critical decisions that will impact its future. Learn more about the Endangered Rivers Report. If you live in Westmoreland, Essex, Caroline and King and Queen Counties– appeal to your local government to establish local land use ordinances that provide long term protection of the Rappahannock River and Potomac Aquifer. If you live in Virginia, appeal to the Virginia House of Delegates and Senate to uphold the Governor’s safeguards and make it known that we cannot tolerate attempts to weaken or remove existing regulations that protect clean drinking water from fracking. Your Voice Does Matter. Join Friends of the Rappahannock and other concerned citizens by making your voice heard on the local and state government level. Help protect our river and water source for generations. 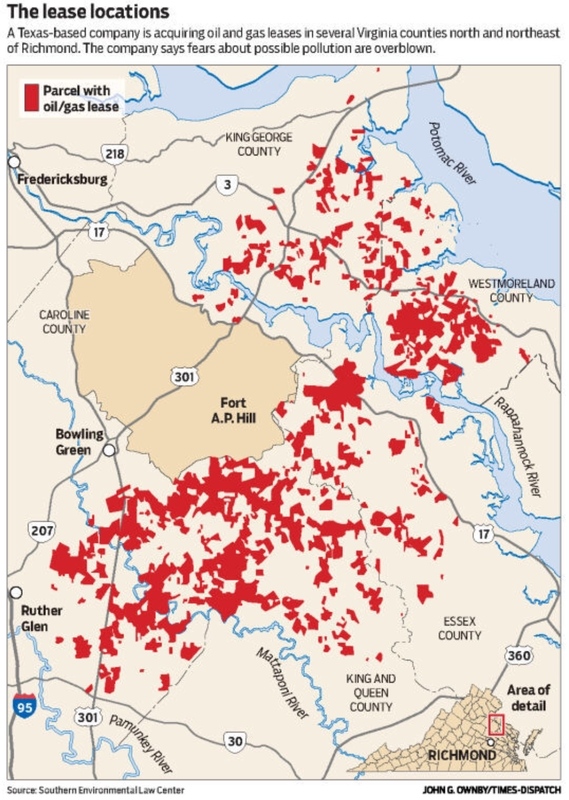 Fracking is a very real concern for the Rappahannock. There are currently 85,000 acres in five counties leased for oil and gas exploration and hydraulic fracturing (“fracking”) along the tidal Rappahannock and many of its tributaries. In the past four years, only one out of the five counties, King George, has passed a land use ordinance designed to protect its environment and natural resources, residents, local economy and infrastructure from the potential negative impacts of fracking. Four pieces of legislation at the state level were introduced in the beginning of 2017, with the support of the natural gas industry, that would weaken the existing legislation that requires disclosure of fracking chemicals and water quality monitoring. Local partners were successful in defeating the legislation. In order to remove this threat, it is up to the local government to establish protections to guarantee the safety of their citizens’ drinking water, infrastructure, and local economies.